Calcium has a relatively narrow safe range for captive lizards. Over-supplementation can be just as dangerous as under-supplementation. Because of the wide variety of factors involved in determining the proper calcium levels for your lizard -- including species, age and husbandry -- you should let your veterinarian determine the right calcium supplementation schedule for your pet. The reason many lizards require supplementation has to do with the chemical composition of their food. Some vitamins and minerals interact with each other, and imbalances between them cause problems. For captive lizards, it is important to keep their dietary calcium and phosphorus in the proper proportions. The proper ratio of calcium to phosphorus is about 2 to 1; unfortunately, many lizard foods are high in phosphorus and relatively low in calcium. Calcium supplements can serve to help balance the ratio in your pet's nutrition, but you can't just give supplements for the sake of giving them. It is important to understand which lizards are more likely to require heavier supplementation than others. Any lizard that has high calcium demands is likely to require relatively heavy supplementation. This includes growing juveniles and reproductive females. Adult males usually have lower calcium requirements than other size and gender classes. Additionally, the prey your lizard consumes influences the supplementation schedule: Insects, fruits and some vegetables are very high in phosphorus, requiring additional calcium to restore balance. Lizards such as monitor lizards that primarily consume whole-food prey typically do not require as much supplementation. Veterinarian assistance is necessary to address your lizard's specific needs. Acquiring calcium is only one part of the process -- lizards must be able to use the calcium they obtain. To use their calcium, they require vitamin D3. Most diurnal reptiles produce vitamin D3 when they bask in the sun. Specifically, it is the UVB wavelengths of sunlight that prompt the lizards’ bodies to produce the vitamin. While many diurnal lizards require exposure to UVB to produce the vitamin, some species -- particularly nocturnal and crepuscular species -- produce the vitamins without exposure to ultraviolet light. The dangers of over- or under-supplementation are potentially life-threatening. 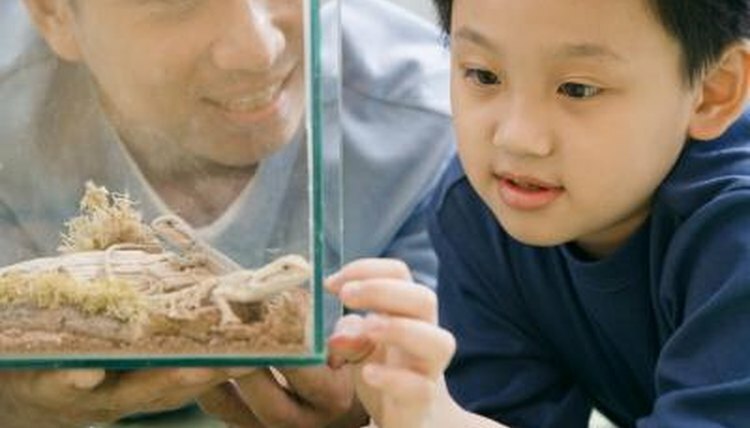 Discuss the natural history of your pet lizard with your vet, as well as the type of lighting and food your lizard gets. By considering this information along with your lizard’s weight, age and species, your vet can develop a custom recommendation for your pet. While she reiterates the need for veterinary assistance in developing a supplementation regimen, veterinarian Margaret A. Wissman suggests that keepers supplement their lizards food with a 4-to-1 mixture of calcium and vitamin powder. As a general guideline, she advocates dusting the food three feedings per week.